The directory contains powerful search capabilities, along with the ability to easily update and manage most of your profile information (after logging in). Use the big search box on the homepage by typing inside of it. You can search by someone’s name, or enter a topic / keyword to search for. You can enter partial names (such as “car mor”) to find results matching the beginning of someone’s first name and the beginning of their last name. As you type more letters, the available results will continue to refine – click on someone’s name when you find a result you want to see more information on. When entering a keyword / topic in the search box, you may be presented with the option of selecting either “Clinician’s Profiles” or “Researcher’s Profiles” results in your search. These combination filters will allow you to see a list of people with that term listed in their profile. For even more power, click on the ‘Search’ button (or hit Enter on your keyboard) after you’ve entered your search term or name to expand your results. On the left-hand side of the search results are the advanced search filters. These filters allow you to filter within specific areas of the profile. For example, the “Working Titles” filter will allow you type in a title (such as Professor) and find only those individuals within your results that have set that title. By default, each filter will attempt to display the 5 most relevant terms for that area. You can then add them to the filter by clicking on the small blue circle with the plus sign in the middle. As you add and/or remove search terms from each filter the search results will automatically update. You can update your profile information by clicking on the Log In button located in the upper right-hand corner of the window. 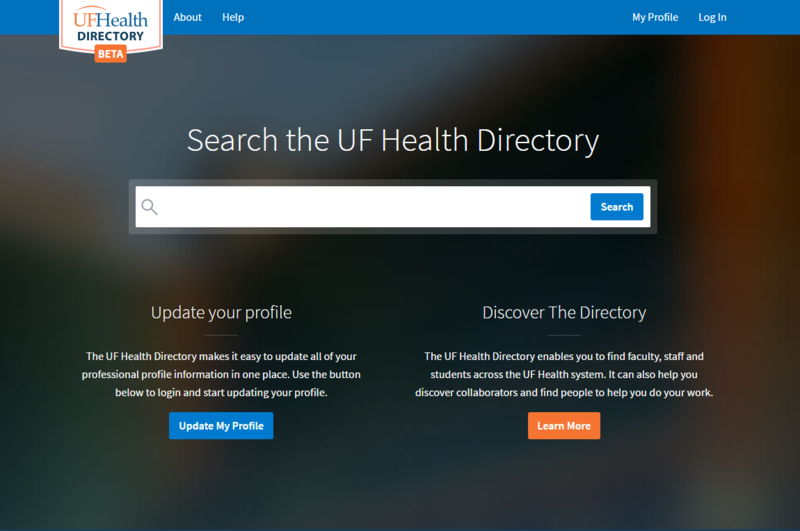 The website will ask you to login using either your Gatorlink ID and password, or your Shands ID and password. Once you are logged in, the site will redirect you to your profile where you can begin updating your profile. Editable fields will be marked with a small plus sign or pencil icon that you can click on to edit that field. As you edit and save each field, your directory profile will be updated. In some cases, you will not be able to directly edit a field within the directory. If this happens, instructions will be provided to help you make those updates.